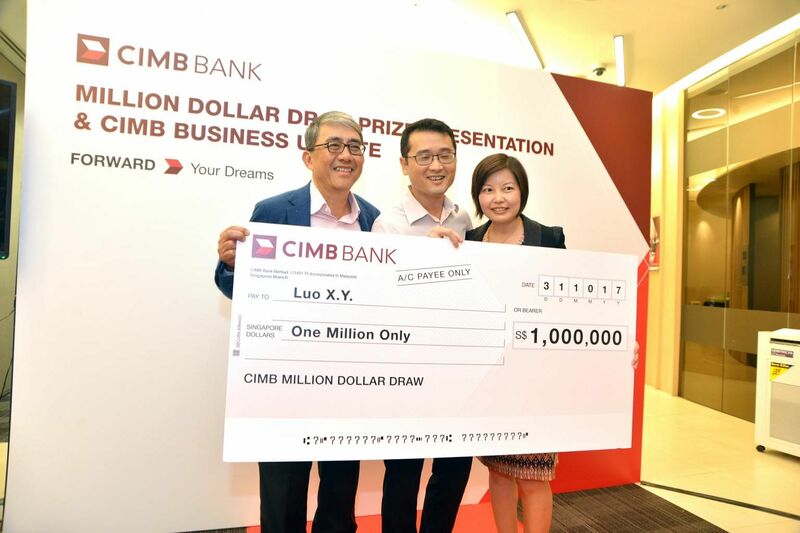 SINGAPORE - When Mr Luo Xiang Yue was invited to head down to CIMB Bank's Raffles Place branch, the last thing on his mind was that he would become Singapore's next millionaire. He was told to simply show up at 7pm on Tuesday (Oct 31) for a bank anniversary event. He entered the outlet to find himself surrounded by ushers, a big dollar sign mascot and a treasure chest. Opening the treasure chest, he read out the words on a golden ticket informing him that he had just won $1 million. The Singaporean maintained a puzzled look on his face as confetti rained down on him. "I suspected absolutely nothing," the 40-year-old civil engineer told the Straits Times. "I'm still not over the shock. Is this real?" CIMB chief executive officer Mak Lye Mun later presented Mr Luo and his wife with a giant cheque on stage. The unsuspecting couple smiled bashfully throughout. CIMB had announced their first-ever Million Dollar Draw for Singapore in June 2012. This is the first such marketing event of its kind in the banking sector here, although Changi Airpot holds an annual "Be a Changi Millionaire" lucky draw. After CIMB, which opened here in 2009, garnered 88,888 personal accounts at the start of September, the bank picked a winner from a special online system draw formulated for the contest. Eligibility criteria included having a CIMB StarSaver or Junior account, and having $20,000 or more in their bank. Each $20,000 out of their total deposit would amount to one chance. When asked what he would do with the money, Mr Luo said: "I don't want to rush to plan it out. Maybe I'll consider investments? But I'll let my wife decide." CIMB will be holding another draw starting on Wednesday (Nov 1), where one lucky couple get to choose their dream travel destination.